In the nature every animal lives in harmony among themselves. Except when it comes to the case of the Alligators who take advantage of their friendly neighbors, the mellow and passive hippopotamus. This is a picture taken in the moment of the action! 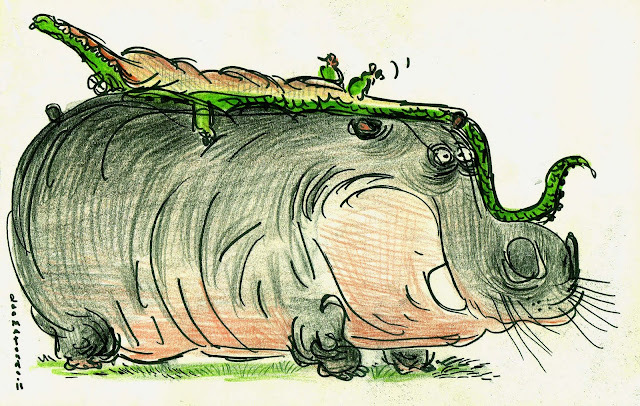 See how the Alligator jumps on the top of the comfy hippopotamus and spread his tail all over the other animal's face. After passed 6 hours the reptile is still on top of the poor creature. Gators describe their friends as" the lazy boy of the wilderness". Hippopotamus don't enjoy this remark a bit. When our greyhounds flip over to relax, it's called 'roaching' as in dead cockROACH. Far too awesome! Love the pencil in there, especially. hahaha, this is fantastic. love the little crocodile toes. I love this drawing. So Bill Peet!